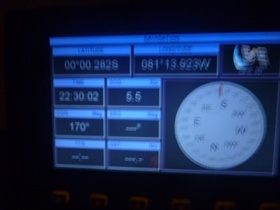 Crossing the equator for the first time is an important moment for any cruiser. 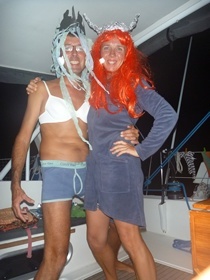 So, at 10.30pm we woke the kids got them to dress up in silly clothes, put shaving foam on our cheeks, Liz kissed skipper's stomach, champagne and other food offerings were sent to Neptune and then it was all over. Kids back to bed, and on we go to whatever waits in Ecuador. We are now in the Southern hemisphere and another chapter of the adventure begins. 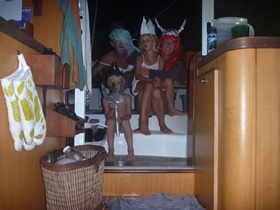 Note decorated hats on heads and wigs to scare evil sea monsters away.